The computer games collection Adventure Collection by Starbyte was issued in 1993 on diskette. The sales price at that time was about ?? DM. The collection was also released on the Amiga. 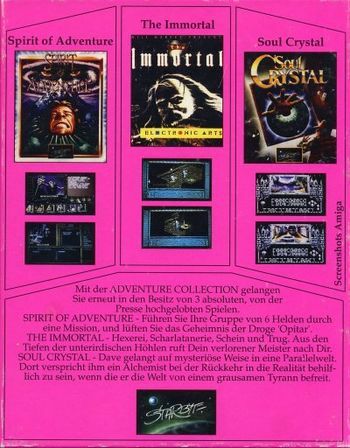 The Amiga version however contained the game The Immortal instead of Crime Time. The games are on 6 disks. Next to the disks there are also 3 manual booklets as well as 3 additional manuals in the pack. Obviously for reasons of economy was the packing from the Amiga version also used for the C64 release. 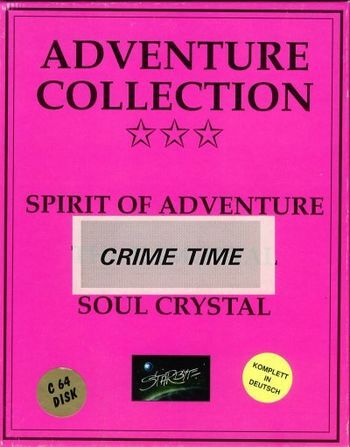 There was simply a Crime Time sticker glued over the The Immortal writing, the reverse side stayed unchanged.